Cinque Terre is an original destination for a wedding abroad. 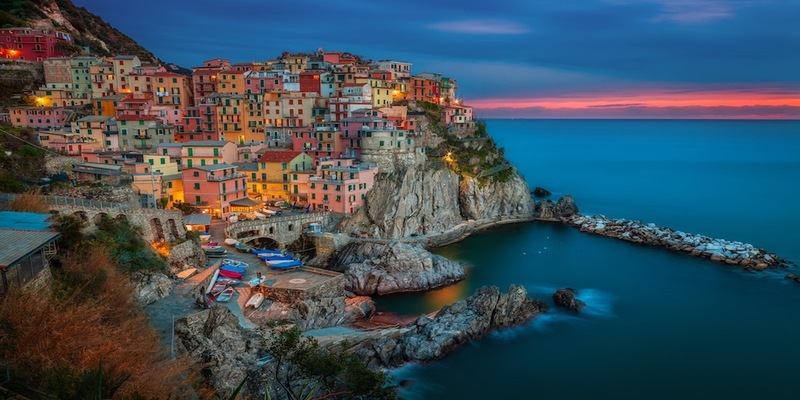 It is a territory located near La Spezia, close to the edge of Tuscany, consisting of five amusing cliffside towns on the coast, recognised as a World Heritage Site by UNESCO, and where both the water and mountainside have been declared national parks. An important site environmentally and culturally, that was described as ‘the harmonious interaction between people and nature to produce a landscape of exceptional beauty’. A Cinque Terre wedding is a romantic destination wedding. The five villages nestled on these dizzying shores are charming and quiet, and they maintain that typical old Italian atmosphere. Monterosso al Mare is the easiest to reach among the five hamlets, known for Lemon trees and Anchovies, it is divided in two parts, the old and the new one, linked by an underground tunnel dug under the San Cristoforo promontory. The beach is the only broad sand beach in the Cinque Terre area. Vernazza, probably the quaintest of the Villages, it is considered one of Italy’s most beautiful hamlets. Vernazza is the fourth town heading north, has no car traffic, and remains one of the truest ‘fishing villages’ on the Italian Riviera. The colourful tiny port is a natural inlet that guarantees a safe docking since the time of the Maritime Republics. Corniglia is a fraction of Vernazza and it’s the only village not directly overlooking the sea, as it is placed on a promontory about 100 metres high surrounded by Vineyards and Terraces. You have to walk around 400 steep stairs to reach it, or a street that leads from the station to the hamlet. This is characterised by narrow roads and a terrace in the rock from where it is easy to see all of the other 4 villages. Manarola is built on a high promontory and the brightly coloured buildings arise on the gulch that goes down directly to the docking. Among the five hamlets this is the one that offers more vineyards, and it is well known for the production of the Vino Passito Dolce Sciacchetrà, a sweet wine that has a unique taste. Riomaggiore is the eastern hamlet, dating from the early Thirteenth Century. The pastel coloured tower buildings surrounding the hamlet make the sunset view even more warm and cosy, totally worth the visit. Via dell’Amore (Love’s Trail) is a path connecting Riomaggiore to Manarola.